To begin the new semester the class was assigned a project that would be broken down into parts but would span the entirety of the semester. 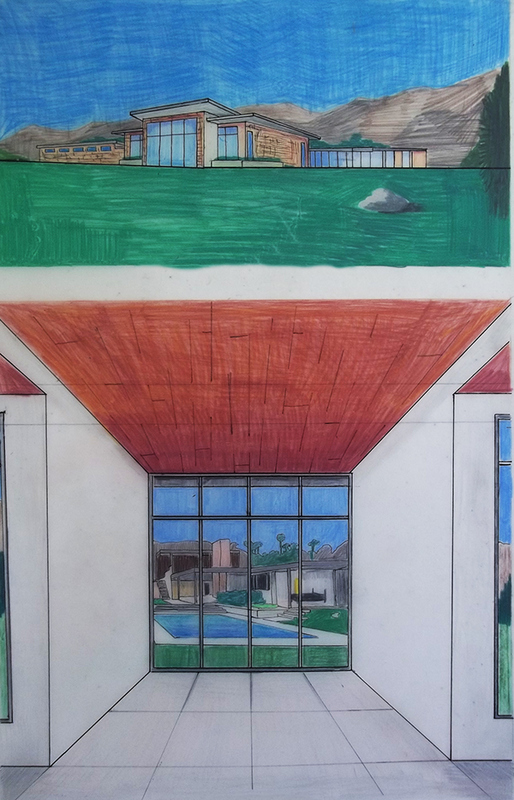 The first part of the project involved splitting the class into partners and researching a well-known house designed by an influential architect. 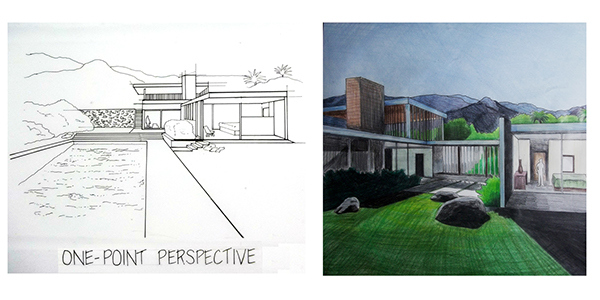 My partner Kevin King and I selected the Kaufmann Desert House designed by Richard Neutra as our house to study. The Kaufmann Desert House was built in 1946 and designed for Pittsburgh business mogul and patron of the arts Edgar J. Kaufmann. 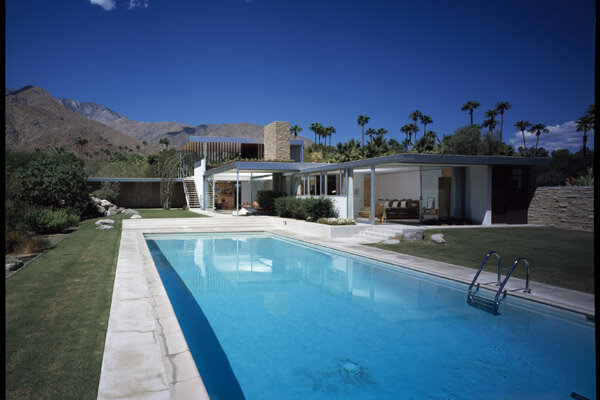 The house is located in Palm Springs, California. 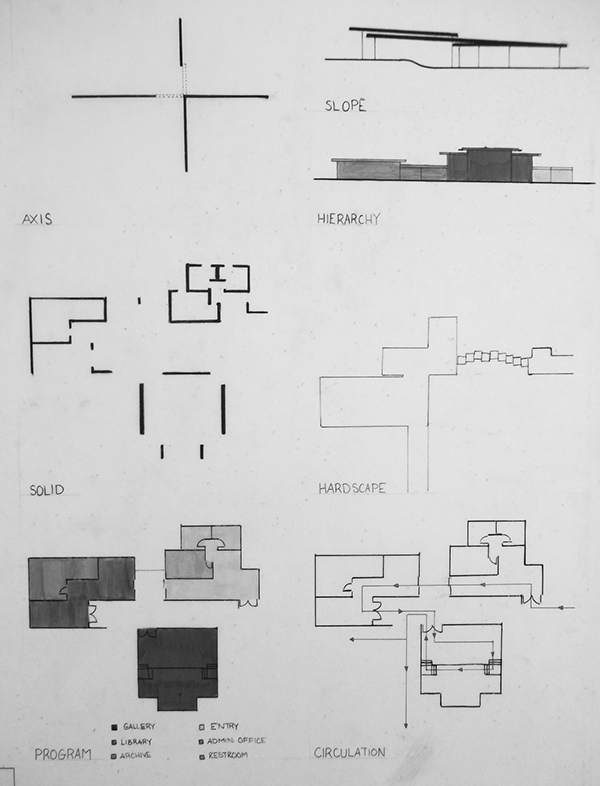 Using our university's library, Kevin and I found plans, sections and elevations of the Kaufmann Desert house that we used in our final presentation to better visualize the house. 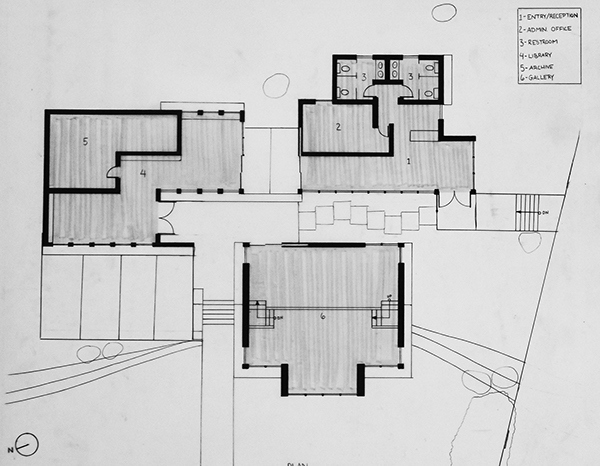 The original plan of the Kaufmann Desert House that Kevin and I created. These sections and elevations of the Kaufmann Desert House are of the two most photographed facades, the east and south sides of the house. 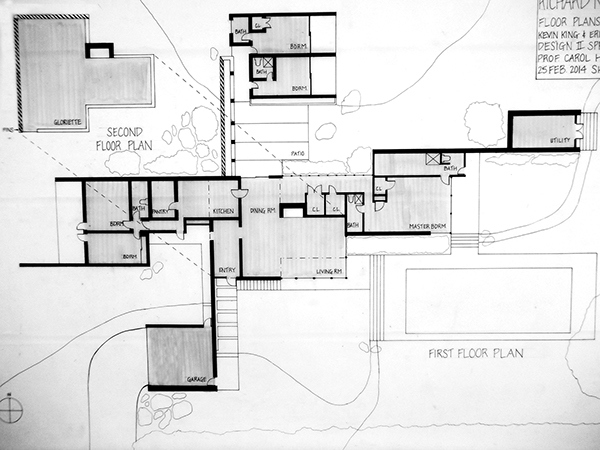 After obtaining plans of the house and learning about Neutra's design intentions, Kevin and I used the knowledge gained from researching to create analysis diagrams of the house in order to better understand Neutra's theme for the house. The analysis diagrams have a range of concepts, beginning with horizontality and spanning from concepts such as datum, core, circulation, and program. 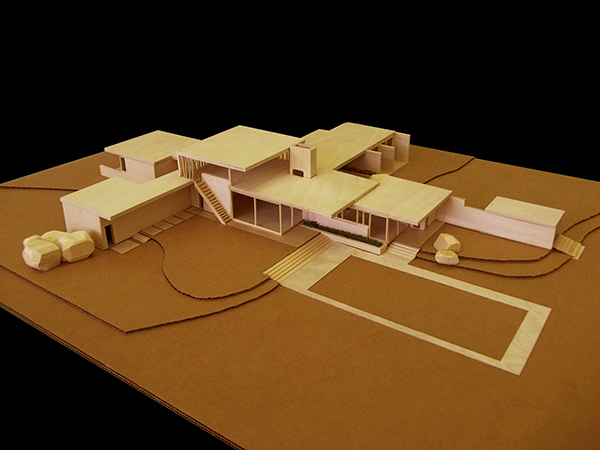 Another piece to the final presentation required a one and two-point perspective of the Kaufmann Desert House. On the the left is the drafted one-point perspective. On the right is the two-point persepctive rendered on vellum with colored pencils. 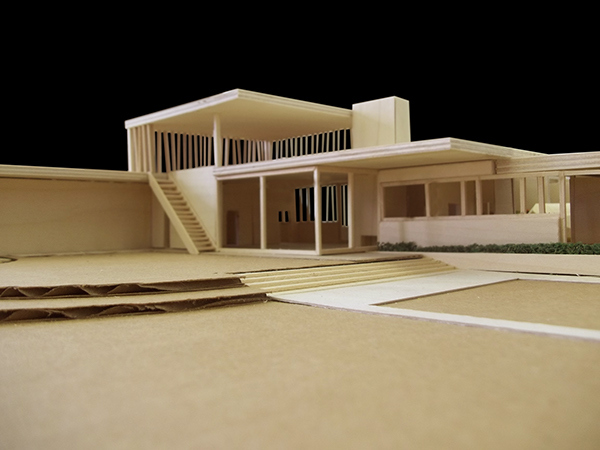 The final part to this section of the project was to build a model of the house. Kevin and I worked together to build the model as accurately to the house as possible. 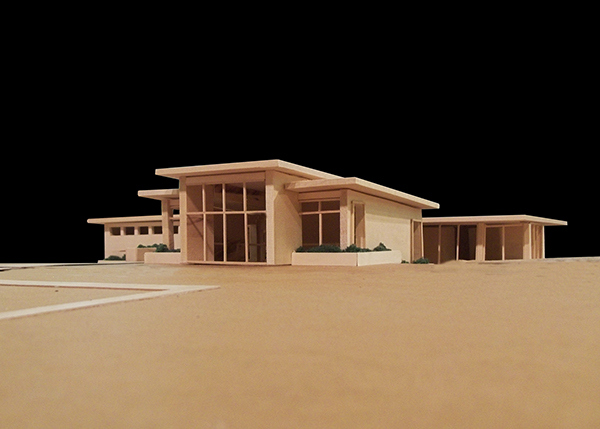 Here are some post-processed photos of the Kaufmann Desert House. 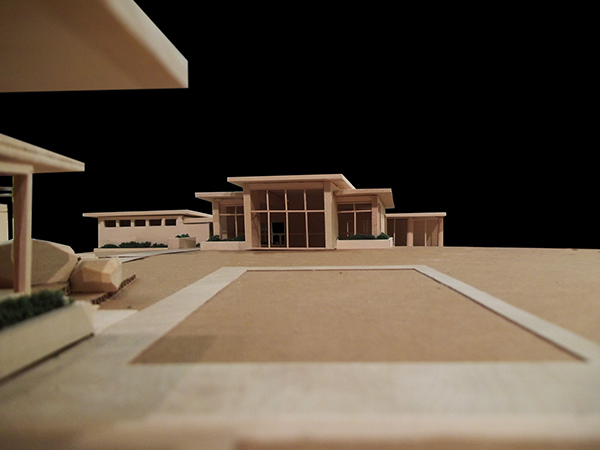 (Top) is the full site model, (middle) is a view of the master bedroom area, and (bottom) is a view of the central living space and rooftop gloriette. For Project 2 the class had to design a material collage board known as a Mondo Materialis that shows the materials the architect used in their house. 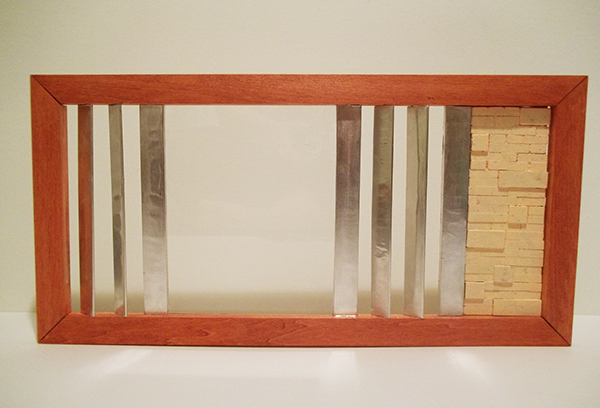 Neutra used wood, stone, aluminum, glass and steel in the Kaufmann Desert House. (Above) the full Mondo Materialis board, dimensions are 12"x24." (Below) a different perspective shows how the board interacts with light similar to how the aluminum fins in the original house do. 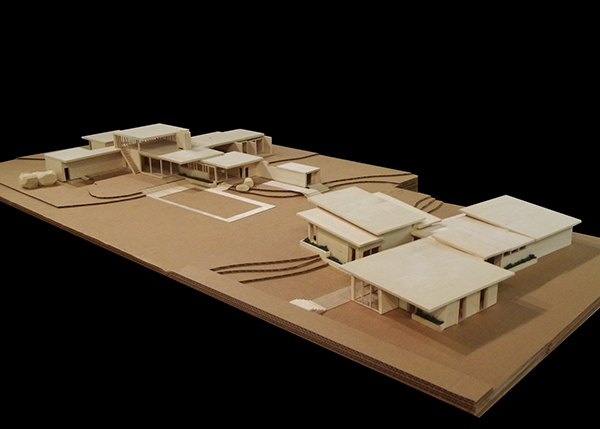 The final project of the semester saw the class design a Visitors Center based on the knowledge the students gained from studying and building the original house. The Visitors Centers were designed individually by each student and were then presented at the final critique. 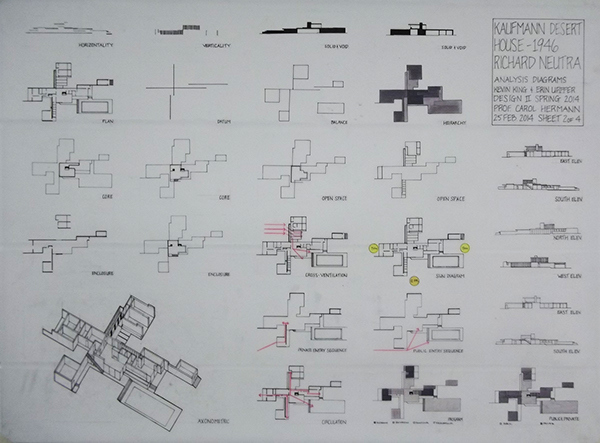 Overall, my Design 2 course helped further the skills and knowledge I need to become a better architect. It taught me the importance of analyzing to better understand the logic and reasoning behind design. I would also like to thank my professor, Carol Hermann for being a helpful intstructor and for pushing the class to do their best. This is my Design 2 portfolio for my second semester of Architecture school at Philadelphia University. The portfolio will display the work I have done in the exploration and analysis of a famous house. 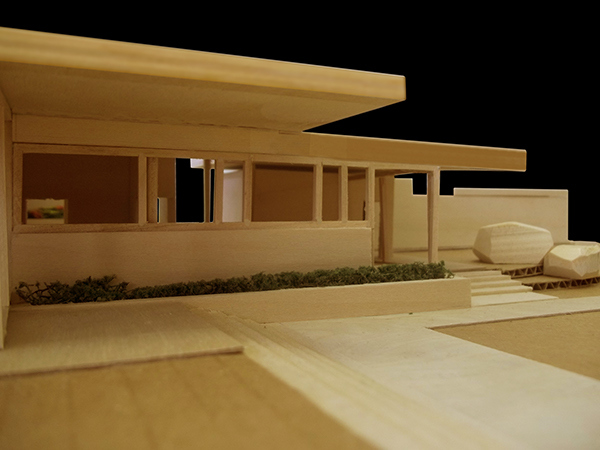 The knowledge gained in the process has culminated in the final step of this semester-long project, designing a visitor center for the house.